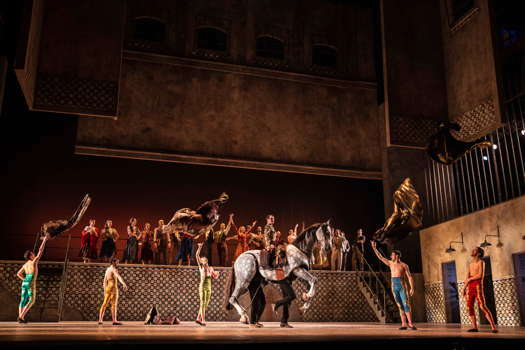 On 2 February 2019, Teatro dell'Opera di Roma was filled to the hilt for the opening night of Carmen. But it was not Bizet's Carmen on a libretto by Meilhac and Halévy, one of the most popular and most performed operas in the world, often reviewed in this magazine. 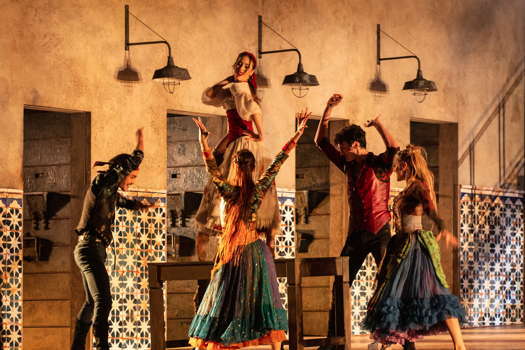 It was the premiere of a brand new Carmen created by well-known choreographer Jiří Bubeníček on Prosper Mérimée's original novel and with music not only by Georges Bizet, but also Manuel de Falla, Isaac Albéniz, Mario Castelnuovo-Tedesco and Gabriele Bonolis. Bonolis skillfully crafted the various compositions into a coherent score and provided the orchestration. Thus, it is a ballet but it's not Bizet's opera set as a ballet like the well-known production by Antonio Gades and Carlos Sauras which travelled all over the world some thirty years ago. The libretto starts with Don José's capital punishment by hanging, and then a long flashback tells the story of his love for Carmen, a wild horse that no-one can either train or tame. On the contrary, Don José is a weak and almost shy fellow who wanted initially to become a priest and after enlisting in the Army becomes a serial killer. He murders, first, his lieutenant, then Carmen's husband, and finally Carmen herself. 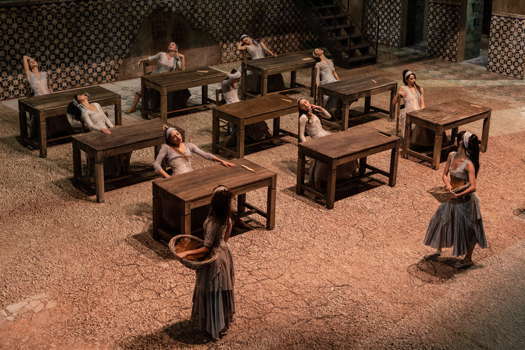 In fact, the libretto follows Mérimée more closely than a previous attempt: La Tragédie de Carmen created in 1983 by Peter Brook, where the original libretto of Bizet's opera was cut, pasted and revised, but not drastically changed. Some of Bizet's opera characters are not present in this new Carmen, most notably Escamillo and Micaela. Others are added on the basis of the novel: most significantly, Carmen's husband, García, and a British general - one of several of Carmen's lovers. The plot holds together quite well in two acts of roughly one hour each. An interesting aspect is how the score was rearranged and molded with compositions by other musicians. Even Bizet's music was re-orchestrated and molded with, for instance, the introduction of De Falla's El Amor Brujo, 'Ataceder' from De Falla's El Sombrero de Tri Picos and Castelnuovo-Tedesco's Siciliana for flute and guitar. The pastiche - a frequent habit in baroque opera - holds well as a cohesive whole. Teatro dell'Opera's good orchestra was conducted with ability by Louis Lohraseb, who has, no doubt, a merit in making this world premiere vibrant and full of tension. Gianni Carluccio's sets are simple and effective: a single set integrated with painted drops and projections. Brown is the dominant color. Also, Anna Biagiotti's costumes are almost Spartan, but in line with the music and the sets. There are two cast alternates in the nine performances programmed for this first round of Bubeníček's Carmen. On 2 February, Rebecca Bianchi was a wild sensual Carmen, Amar Ramasar a tormented Don José, sliding from well-behaved young man to multiple killer, Gaetan Vermeulem was García, lurid as Carmen's husband, and Giuseppe Depalo was a lusty rich British General. The evening was a triumph for this new Carmen. The audience followed the performance silently; at the end, it erupted in almost ten minutes of ovations.